I’m not a headphone snob. 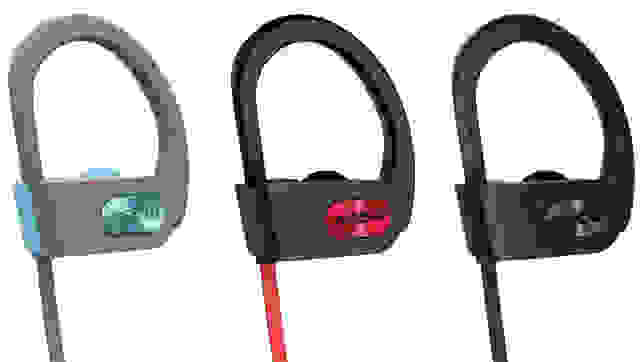 Even though Reviewed has tested hundreds of the best headphones over the years, I’m fine with cheap earbuds if I’m just going for a run or heading to the gym or listening to a podcast at the office. That’s why I really love the $20 Mpow Flame waterproof earbuds. They’re perfect for commuting, working out, or just vacuuming around my house—and they only cost around $20 at Amazon. We submerged the Mpow Bluetooth Wireless headphones in water, and they still worked afterwards. For starters, these wireless earbuds handle the basics well. They sound great, they fit wonderfully, and the earhook design stays on even through tough workouts and long runs. They were also easy to pair with my Android phone and my wife’s iPhone, the battery life was good, and charging was simple enough. For only $20, that’s more than enough, to be honest. With so few phones offering headphone jacks these days, the need for cheap Bluetooth earbuds is dire. Those little USB-C and Lightning dongles are way too easy to lose, the included wired earbuds aren’t ideal, and you’re going to need a backup pair at some point. For $20, these fit the bill beautifully. We submerged the Flame earbuds for a full 30 minutes and they still worked fine after. But the Mpow Flames go above and beyond with exceptional water-resistance. We recently put them through their paces for our article on the difference between waterproof and water-resistant headphones. In that testing, we were able to submerge the Flames for a full 30 minutes—while playing music!—and they came out of the ordeal working just fine. One of the snags with nearly all Bluetooth earbuds? They are usually not that durable. I’m sure everyone has a bunch of wired earbuds kicking around their junk drawer that still function fine—or they would, if your phone still had a headphone jack. Bluetooth earbuds, on the other hand, rarely last that long; they’re more complex, fragile, and they rely on batteries that wear down over time. The Mpow Flames come in all black, blue, and black and red color combinations. That’s what makes the Flames a great buy; though they’re as durable as any wireless earbuds we’ve tested—and I’m confident they’ll last quite a while—they’re also cheap enough that you’re bound to get your money’s worth either way. Are there better wireless earbuds out there? Certainly. If you care about sound quality, I definitely suggest you check out our roundups of the best wireless earbuds, the best true wireless earbuds, and all our wireless headphone reviews to get to know all the best options you have. But even if you invest in a high-quality pair, you’re bound to need a cheap backup, too. Pick up a pair of these earbuds, toss the case in your bag, and pop them in when you need them. Chances are, they won’t let you down.